I’ve done something crazy. I mean, crazier than signing up for just Nanowrimo when there are so many other things I need to do. But just two days before Nanowrimo kicks off I’ve gone and signed up for ReviseResub’s Nanowrimo mini challenge. For this challenge, we are broken into teams (based on genre) and paired with a Revise Resub Agent. The goal is to be the team with the most words! Yep! Now there are actually people holding me accountable, and I have teammates who are depending on my word counts. Welp, it is a good thing I work well under pressure! You’ll see a lot of tweets regarding my team (#TeamVictoria) so cheer us on when you get the chance! Oh yeah, and I’m also going to be supporting my local writing group as we all do nanowrimo. I’ll be doing a complete rewrite of an old YA Science Fiction Story I’m tentatively calling, THE BIBLIOPHILE’s MUSEUM. Shay Dahling is a hacker, determined to live under the radar in a technology-obsessed world. When she breaks the entry code for the Museum, a building that claims to bring scenes from storybooks to life, she is forced into the limelight. Everyone around her is curious about what’s inside the Bibliophile Museum, but Shay only wants to get her brother released from military custody. In exchange for her brother’s freedom, Shay joins a military excavation team into the Museum where they discover a deadly secret: the building is a deathtrap, with no escape. What you can expect from me in the next month? I’ll try to do weekly posting on my status, encouragement posts, and tips! I’ll also try to post some #Nanowrimo Tweet Highlights from the week. To get us started here are some tweets of the calm (or not so calm) before the storm! 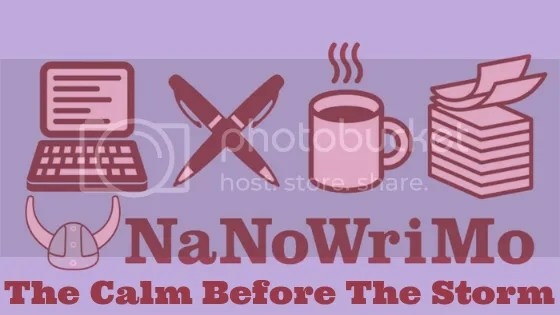 My twitter feed is #NaNoWriMo chaos now that people are realizing we have two more days!! *Deep Inhale! * Alright. I have wine, caffeine, snacks, and motivation!